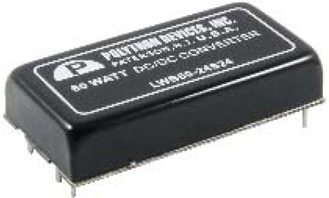 With a low profile package of 1.00" x 2.00" x 0.40", our 60 watt single and dual output DC-DC converter features six-sided continuous metal shielding, RoHS compliance and a minimum input/output isolation of 1600 Vdc. This design is also safety-approved and meets all UL60950-1, EN60950-1 and IEC60950-1 requirements. Low Profile Package: 1.00" X 2.00" X 0.40"
24 Vdc input: 50 Vdc 100 ms, max. 48 Vdc input: 100 Vdc 100 ms, max. 24 Vdc input: 9 Vdc, max. 48 Vdc input: 18 Vdc, max. Output Power: 60 Watts max. Over voltage protection, Zener Diode clamp. Switching Frequency: 275 kHz Typ.